Fond of Snape » Blog Archive » three in one! Imagine you want to write a book. What’s going to be in it and what is it going to be about? I can’t tell you…someone might steal my idea!!! Name 5 things in your freezer. NaBloPoMo prompt from Friday: What’s your motto? Have fun! Enjoy life! Why so serious? Pick and choose at random, as necessary. Today’s prompt is: What’s your most important personal goal for the next year of your life? Hmmm…I don’t really set goals…I’d like to lose 30 more pounds…ok, there’s my goal. 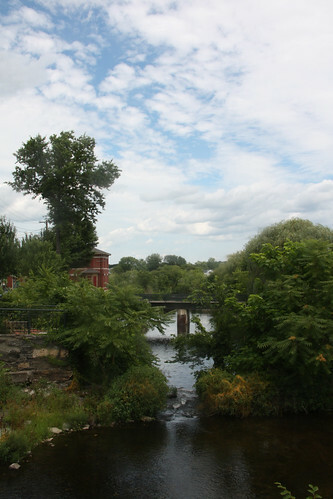 Lowell is full on canals…here’s a shot of one. How was your weekend? The freezer thing reminds me of a funny story. The other day I saw a bag of the gnarliest looking freezer-burned seafood in my freezer. I threw it out because who on Earth would want to eat that. The next day my oldest son was wondering what the hell happened to his bag of fish bait. Pretty picture. Our weekend was good. Now all I need is a really good molasses cookie recipe and my life will be perfect! Love that photo. Everything looks so lush. So are you thinking of writing a book? Luv the photo! I think you look fantastic and don’t need to lose 30lbs! Molasses cookies are my kryptonite. Don’t tell anyone.